Description Help these rabbits to exit from the laboratory before they used by the professor to conduct research. You will move these two rabbits together to reach the exit door. Let's reach the exit door fast before the time runs out. Avoid all evil rabbits and attack them so that the rabbits can continue to walk to the exit door. Let's complete 30 challenging levels in this game and make all rabbits can exit from the laboratory together. 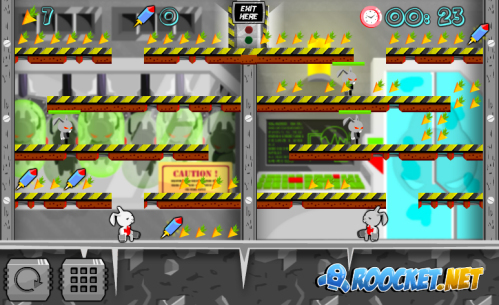 Controls Use arrow keys to move the rabbits and spacebar to shoot.